Well-organised local activists from Kraljevo managed to prevent the project of building ten small HPP on the river Ibar. In March 2009, the Serbian electricity company JP Elektroprivreda Srbije (EPS) and Italian company Seci Energy S.p.A. signed a cooperation agreement for a construction of 10 hydroelectric power plants (HPP) on the River Ibar in Serbia including territories of the two municipalities Kraljevo and Raska. As soon as the first news of the HPP project appeared, the local non-governmental organizations, recreational users (kayak club, hiking club) and fishermen established an association “Kraljevacki ekoloski forum” to oppose the project implementation. The association argues that damming of the water by constructing HPP would lead to increased ecosystem pollution by sediment accumulation and therefore endanger local biodiversity. The project would also put under hazard the fortress of Maglic, a historical-cultural monument under national protection, and make it impossible to maintain sport activities, such as the Annual European Kayak Championship. However, not all of the people were against the project. The citizens of Ušće village have seen the opportunity for economic benefits from new potential jobs in the HPPs. However, the association was supported by the Kraljevo village mayor at that time as well by professionals of the communal drinking water company that warned about the possible project's hazard for the drinking water supply of the municipality of Kraljevo. In April 2010, the association delivered a petition signed by 1000 citizens of Kraljevo to the municipal authority asking for the project cancellation. However, in July same year the EPS and Seci Energy S.p.A. established the shared company 'Ibarske hidroeletrane' doo. In 2011, the association kept on lobbying against the project and delivered another petition, this time with 2500 signatures. In July 2011 the Seci Energy S.p.A., 'Ibarske hidroelektrane' doo and National Agency for Spatial Planning signed an agreement to create a common special strategy for the region regarding the 10 HPP on river Ibar (Spatial Plan) and develop a strategic environmental impact assessment (SEIA) of the project. In October same year, the Italian economy minister Paolo Romani and Serbian energy minister Milutin Mrkonjic signed a strategic partnership between the two countries in the renewable energy sector, that implies importing electricity produced from renewables in Serbia and Bosnia and Herzegovina and transported through the marine energy cable via Montenegro. This agreement was one of the steps of the Italian government strategies to reach the EU goals for 2020 of 17% energy consumption from renewable sources. The 10 HPP project includes a 10 years exclusive use right to the newly formed company 'Ibarske hidroelektrane' doo and allows export of 100% of produced electricity to Italy. The electric power from Serbia will have a price of 150 euros per kWh. 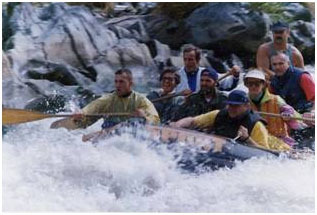 The public debate on the Spatial Plan and presentation of the projects SEIA was conducted in March 2012 when the association pointed on negative effects of the project on the river Ibar. The citizens also claimed that according to the Kyoto protocol from 2014 Serbia would have to pay for the contamination originated in production of “green energy” for Italy. Despite this, the Spatial Plan was adopted. 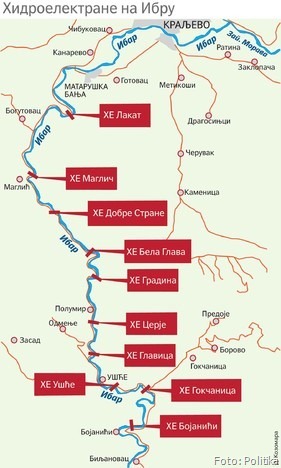 In 2012 the HPP project on river Ibar was marked by the Serbian government as a national project of strategic importance. In December 2013, 'Ibarske hidroelektrane' doo requested for approval of the project's environmental impact assessment study in a public debate in City Hall of Kraljevo. Up to now there is no information on how and if the open debate was held, if the EIA was approved, nor if any construction or energy permits issued. Besides, it is not known how the project will be funded. Project Details Construction of 10 run-of-river HPP in the length of 65km of the River Ibar. The dams would be 12-15 m high, with installed discharge of Qinst = 100 m3/s, average annual output of E = 418.5 GWh/year (generally varying between 300 and 500 GWh), and total installed power of Ninst = 103.15 MW, which represents 1% of current total capacity of Republic of Serbia. The accumulation lakes would be 2 to 4 km long and 50 to 150 m wide. The project would cause flooding of 60 houses, submersion of 6 km of Ibarska magistrala-The Ibar highway, while protected cultural monument, the fortress Maglic, and the monument of Ibar’s heroes, and the protected tree species Pinus nigra would be endangered due to their proximity to dams. In the first 10 years all produced electricity would be exported to Italy with price of 150 euros per kWh. The point on the map locates in the municipality of Kraljevo. Development of Alternatives The association demanded cancellation of the project and have suggested investigating the possibilities to produce electricity from wind energy in the region instead of investing in the dams on the River Ibar. A group of citizens of Kraljevo called on their rights to referendum in which they would decide on the project. Why? Explain briefly. The project leaders pointed out touristic capacity of the accumulation, opening of new jobs in the HPPs construction and operation, economic benefit to all citizens of Serbia, assuring that the project will not have negative impact on environment, particularly on the quality of drinking water. Most importantly, the project was marked as strategically important on national level and it is part of the strategic partnership in energy sector between Serbia and Italy. However, the contract signed by Seci and EPS have been riddled with many irregularities. It seems that the activists have managed to stop the project as there is no information on its development since December 2013. Kraljevčani neće hidroelektrane na Ibru! NVO "Eko Ibar"